I want to own the world. Well, not really. Greed is not really my thing, and I actually love the simplicity of fewer possessions. But I do want to have exposure to the whole world in my investment portfolio. It is not an obvious choice. Since 2010, International equities have under-performed the US market. 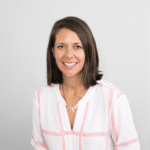 Combine that under-performance with Brexit fears, concerns about economic slowdowns abroad, and geopolitical risks in Asia, and it can seem very tempting to heavily tilt a portfolio toward the US or eliminate international exposure completely. That is probably a mistake. 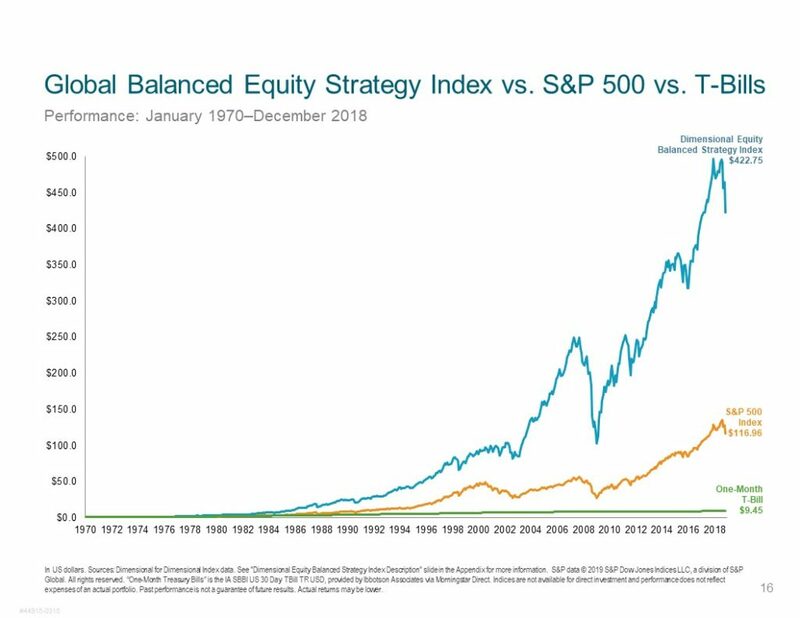 Over the long term, a globally diversified portfolio has outperformed an exclusively domestic portfolio. 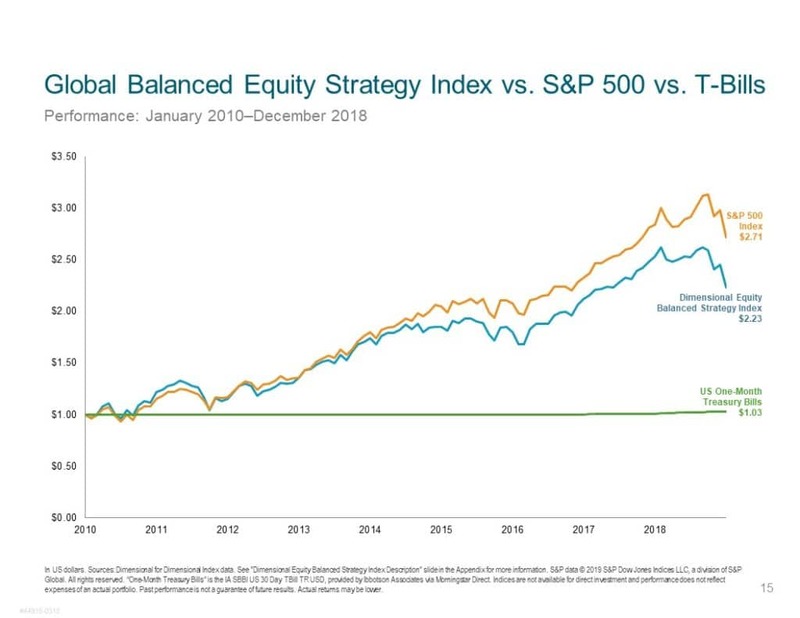 Obviously, if we knew in advance which years the international markets would outperform the US, we would only buy the international stocks in time to get that benefit. Unfortunately, that is not possible. 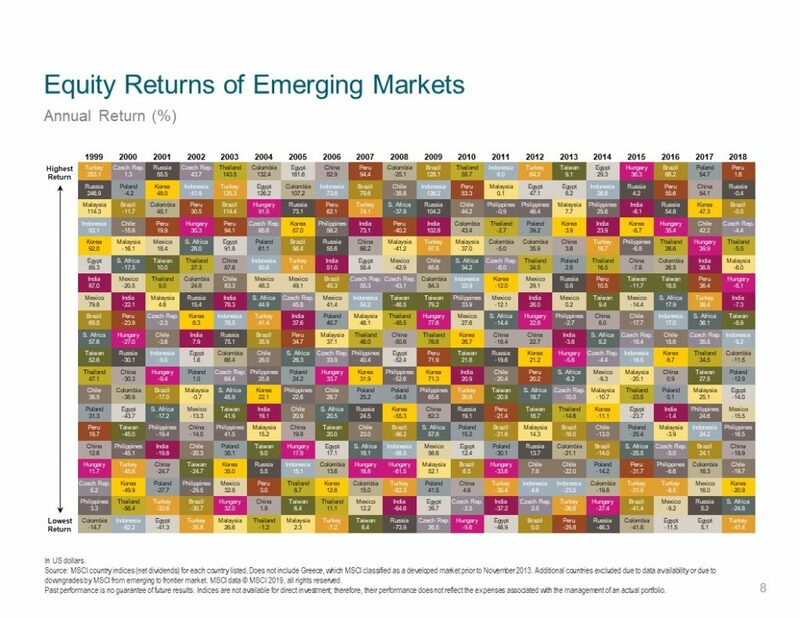 This table shows the randomness of stock market returns by country. The US is all over the board—sometimes near the top and sometimes not. Finland has a pretty good showing: four of the past twenty years in the top spot. On the other hand, Finland is in last place three times too. 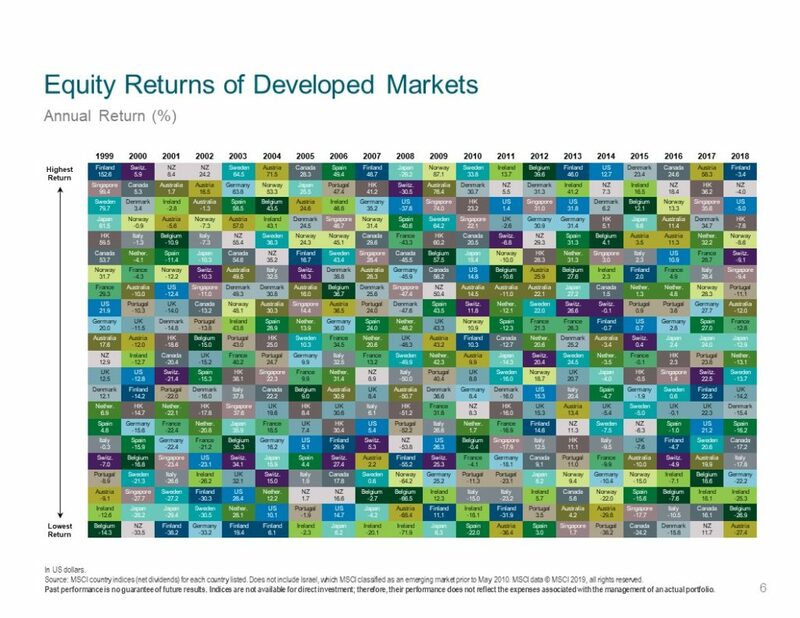 If you can look at this chart and tell me how to predict which country will post the best returns next year, please let me know. If not, it may make sense to make sure you have exposure to all these markets. Notice below that the highs and lows for Emerging Markets are more extreme than for the developed countries. The performance for developed countries in these 20 years ranges from -71.9% to 152.6%, whereas the performance during the same period for emerging markets ranges from -73.9% to 253.1%. Were you invested in Peru last year? It was the top performing country at 1.6% returns, though I don’t remember reading any hot Peruvian stock tips. If you are invested in a broad emerging market ETF or mutual fund, you probably had the exposure to Peru all along. You may still not be convinced. Maybe you noticed that the US has had a narrower band of performance over the past twenty years than this whole collection of countries. Maybe you don’t mind giving up the exposure to markets that have seen 253% returns in a single year to avoid the downside of the other years. After all, US equity returns in this period have ranged only from -37.6% to 28.4%. That might appeal to you—still get some decent upside but not with the extremes that can be seen elsewhere around the world. In that case, please consider this one final point. Have you heard the term the “lost decade” in reference to US stocks? It refers to the period from 2000-2009, when the S&P 500 had a negative return. 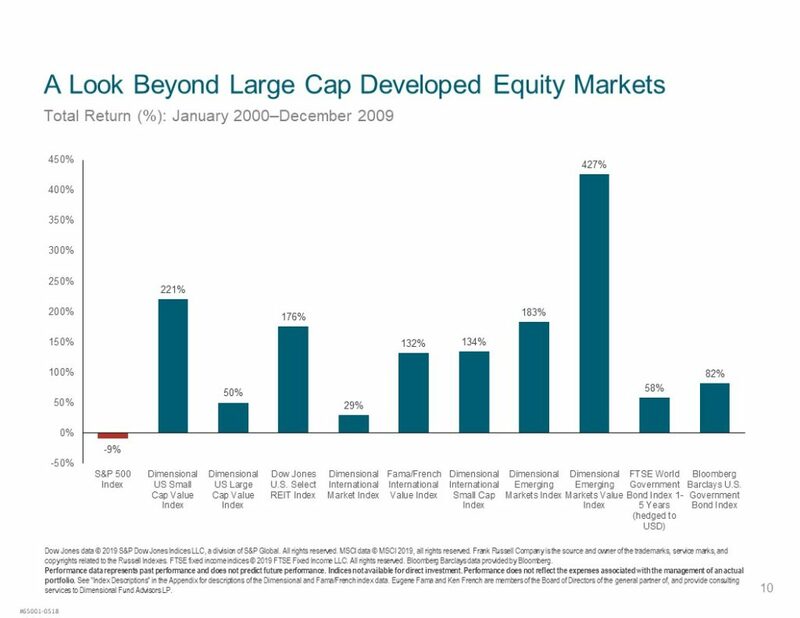 Take a look at what some other asset classes returned during the period. Happy are those who were globally diversified in the early 2000s. Some investors may want to underweight international exposure, and in some years those investors will look very smart. On the other hand, I don’t know which country will take Peru’s favored spot in 2019, and I want to make sure I own a little of whatever that as-yet-unidentified country has to offer. Are you unsure about what exactly is in your investment portfolio? We can help. Contact us today!